Historically, 'S' versions of Apple's iPhone lineup have led to stronger margins than full-fledged redesigns. That's why one analyst expects the newly released iPhone 5s to push Apple's gross margins toward 40 percent in the coming quarters. Maynard Um of Wells Fargo Securities expects that December corporate gross margins for Apple could reach 39.6 percent. And in the following March quarter, he expects decreases in warranty accruals to potentially push margins as high as 40 percent. If his prediction proves accurate, it would be the first time since September of 2012 that Apple's company-wide margins exceeded 40 percent. 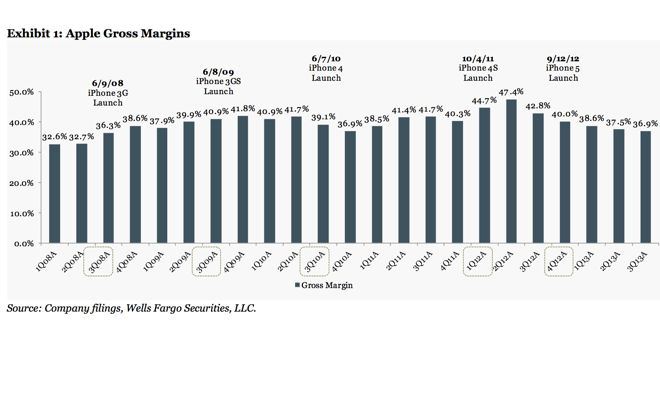 Gross margin took a hit last fall after the launch of the iPhone 5, with a complete product redesign, as well as the competitively priced iPad mini. Apple's margins have shown a clear trend of dipping after the launches of the iPhone 3G, iPhone 4, and iPhone 5. But they have also increased following the debuts of the iPhone 3GS and iPhone 4S. The company's highest point came in the second fiscal quarter of 2012, following the debut of the iPhone 4S, when margins peaked at 47.4 percent. Since then, they have fallen to 36.9 percent in the third quarter of fiscal 2013. If Apple can increase its margins north of 40 percent once again, Um believes it would help to dispel fears among investors about high-end smartphone commoditization. The analyst also believes Apple has plenty of room to expand its iPhone lineup, as it currently has just 280 carrier partners, compared to 650 for BlackBerry at its peak. Wells fargo has reiterated its "outperform" rating for AAPL stock, with a valuation range of between $525 and $575 per share.